The post will guide you through most common issues involved in aspect ratio and the best video aspect ratio converter that will change the aspect ratio, e.g. from 4:3 to 16:9, to fix stretched video and better fit the screen of your target device. Problem 1: You want to watch your cherished recording (4:3 aspect ratio) you shot on your wedding ceremony and have it played on a widescreen TV set. But it looks flattened out. Problem 2: You got a widescreen video in a 16:9 aspect ratio. When you watch this video on a regular TV set that has a 4:3 aspect ratio, your video looks narrow and elongated. Problem 3: The video around has black bars, either across the top and bottom, or down the left and right sides. You want to get rid of these black bars. Generally, you can configure the DVD player or TV set to the correct aspect ratio for proper playback. But what if you want to watch the video on your mobile devices or software media player like VLC or 5KPlayer appropriately? There is one another worth-mentioning solution to make the stretched video display normally - a video aspect ratio changer that aids you to maintain the correct image width and height to fit your TV, computer, mobile device, tablet, YouTube, etc. 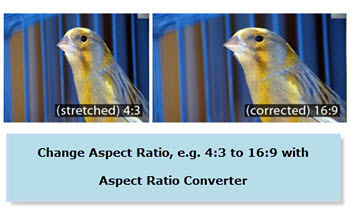 Is This Video Aspect Ratio Converter Best for You? 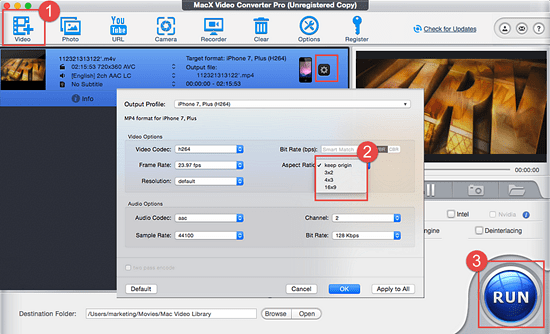 Among the massive programs, MacX Video Converter Pro (Windows version) is proved to be the best all-in-one video transcoder and aspect ratio converter, which changes HD/SD video formats to another, e.g. MP4, MKV, WMV, FLV, AVI, but also converts aspect ratio of the video, e.g. change your HD video in 16:9 aspect ratio to fit your iPod with 4:3 screen, or convert your 4:3 video to fit your Apple TV for widescreen movie watch. 1. Convert SD/HD/4K video formats among each other, e.g. AVCHD, MP4, MOV, WMV, AVI, etc. 2. Change aspect ratio from 4:3 to16:9 for widescreen playback, e.g. on HDTV or vice versa for SDTV or classic mobile devices. Also available for 3x2 aspect ratio. 3. Ready-made profiles for your Apple iPhone iPad, Android Samsung, HTC and other mobile devices, with all resolutions and optional aspect ratio given beforehand. No need to tweak the parameters any more. 4. Directly transfer video to YouTube, Facebook or other web video formats without converting video aspect ratio size for a second time. 5. Basic video editing feature allows you to crop the unwanted parts, get rid of the black bars around the video, watermark and add subtitles to the video, etc. Step 1: Free download the aspect ratio changer, either click the big"+ video" button on the top to import a video file from your computer. You can also go to its windows version to download the aspect ratio converter on PC. Step 2: Click on the cogwheel-shaped button on the right. Here pops up a parameter setting window, where you can choose among the Aspect Ratio options, e.g. 4x3 aspect ratio, 16x9 aspect ratio, 3x2 aspect ratio and keep original. If you are not good at the setting, just leave it unchanged because the ready-made profiles get everything prepared for your specific needs. Step 3: Set destination folder to save the edited video and click RUN button to convert video with proper aspect ratio. Note: You can also activate its crop feature to cut out the black bars, the sides of the frame or other unwanted parts. But you shall also bear in mind crop a video also means losing some information or breaking composition of a video. Make sure to get rid of the part you don't want. Optional: Choose your desired output video format from the pop-up window. With 370+ video/audio codecs, it aids you to convert your source video to MP4, MOV, AVI, MKV, WMV, MPEG, 3GP, etc. For you convenience, the aspect ratio converter is equipped with preset profile of Apple iPhone iPad, Android Samsung, etc, where optimal resolutions with suitable aspect ratio values are given beforehand. The aspect ratio is closely related to the screen resolution. You can figure out the AR by dividing the length by the height of the video resolution. Below are the specific aspect ratios and resolutions. • 4:3: 240 x 180; 320 x 240; 384 x 288; 640×480; 1024×768; 1280×960; 1440×1080; 1920×1440; and 2048×1536. • 16:9: 640 x 360; 960 x 540; 1280 x 720; 1920 x 1080; 2560x1440; 3840x2160; 4096x2304; 7680x4320; 15360x8640. So far, the two most common video aspect ratios are 16:9 and 4:3. The former is the best widescreen aspect ratio for HDTV, Full HD, non-HD digital television and analog widescreen television. It's the only widescreen aspect ratio natively supported by the DVD format. Mobile phones such as iPhone 6/7/7 Plus are in the ratio of 16:9. While the 4x3 aspect ratio is known as full screen, it is a standard TV aspect ratio used by most digital point-and-shoot cameras, Four Thirds system, Micro Four Thirds system cameras and medium format 645 cameras. The newer Apple iPads or other tablets usually feature a display in 4:3 aspect ratio. The 3x2 aspect ratio is used by classic 35 mm film cameras. iPhone 3GS/4/4S and classic iPod touch uses the 3x2 aspect ratio. Below are the pros and cons of these 16x9 and 4x3 you need to know before you change aspect ratio. 1. According to Wikipedia, 16:9 is ideal for display on HD TV and widescreen computer displays. So if you want a full-screen experience while enjoying movies and TV shows, to convert the videos in 16:9 aspect ratio rather than 4:3 is a good choice. This is also a good option in case you need to watch the movie on your iPhone or other mobile phones. 2. It's unnecessary to scroll around when reading comic books as the page fits on the 16:9 screen well, compared with 4:3. 3. When it comes to game playing, there is nothing wrong with the aspect ratios, neither16:9 nor 4:3, because the games will fill the screen good. But most often, the games are made for the 16:9 aspect ratio nowadays, you'd better use the aspect ratio converter to change it to avoid letterbox if on a tablet like iPad, most often featuring a 4:3 display. 4. The 16:9 ratio will offers more information than 4:3 during chatting. 5. For social networks, you are advised to use the aspect ratio changer to change to 4:3 as it offers good look when browsing Twitter or Facebook. 6. For watching movies, you are suggested to fetch a 16:9 computer for better compatibility as movies usually in 2.39:1 or 16:9. 7. Since 2000s, DVDs and TV broadcasts have been shifted from 4:3 to 16:9. To play movies on a tablet, usually in 4:3, you are suggested to change from 16:9 to 4:3 with an aspect ratio converter, or directly watch the movie on computers that usually come with a 16:9 display.